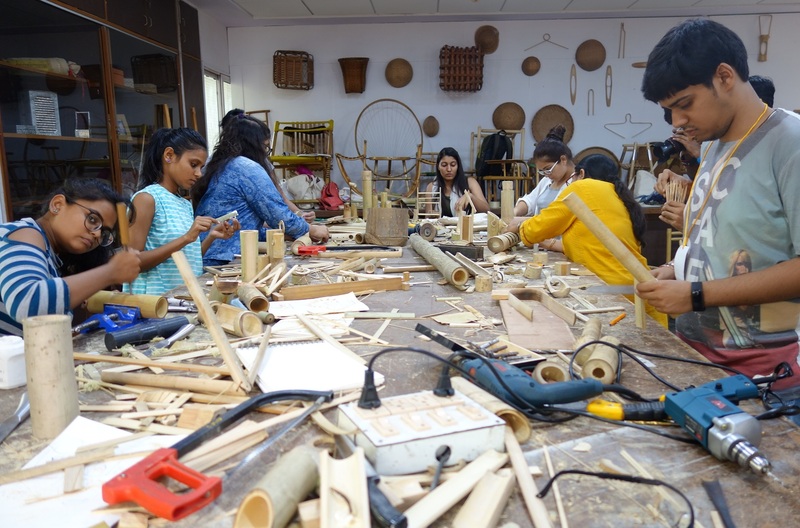 Fourth day of Pravin’s bamboo workshop was another fun filled day with lots of learning opportunities for the participants. They seems to be more comfortable and familiar in working with bamboo on machine as well as with hand tools. It is a great achievement for the participants to create such beautiful and functional products with bamboo in such less time. Sunita showed her creativity by making a hairband for herself while working on her art piece. She found it a great substitute for metal and plastic hairbands. Aditi gave a new look to the fairy lights and a soothing feel to it by using bamboo cut pieces. Insiya wanted to make the piggy bank which would look like a pig and she kept trying different forms. With the help of mentors she was able to make one and it absolutely looks amazing! We are super excited for tomorrow as we will be displaying all the finished products made by the participants at NID.